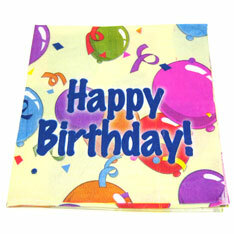 Dinner sized happy birthday balloon napkins. Napkins are 9 inches square when folded. Sold 20 napkins to the pack. Seal wrapped 20 piece unit. Perfect for the next birthday party on your schedule. $1.25 per pack (twenty pieces).